Owego keeps revealing little surprises to us. 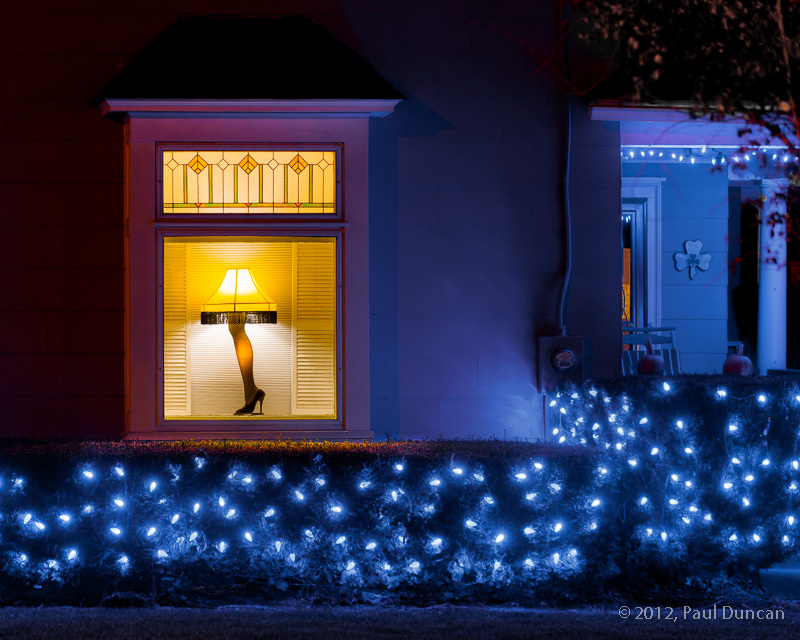 This leg lamp, the iconic “major award” featured in Jean Shepherd’s classic movie A Christmas Story, is beautifully displayed at an Owego home for the holiday season. The tasteful lighting and reverently displayed lamp gave us quite a laugh when drove by on a recent evening. A tip of the hat to the homeowners–thanks and well done. A lot has been happening recently with our home-building project. Matt and his crew have made great progress buttoning up the garage and nearly completing the entrance-way connecting the house and garage. Our geothermal work will commence shortly. Lori and I drove up to Hammond, NY to Vintage Doors to pick up our custom Craftsman style Spanish Cedar front door. The door is beautifully made and the people at Vintage Doors were a pleasure to deal with. They recommended we finish the door with Sikkens brand finish; we used a translucent flat finish that really brings out the beauty and richness of the wood. We eagerly look forward to the time when Matt is ready to install it. Meanwhile, it sits in the front parlor of our rented Owego home. There’s been a lot of progress this week at the house. Most obvious, the garage walls and roof trusses are in place, ready for sheathing. Our builder recommended we go with attic trusses, giving us 8-foot headroom and a very roomy storage area which will be accessible by pull-down stairs. Shortly the entranceway will be built connecting the garage to the house. This will be where our front door will be located, recessed in the nook between the garage and house.